In 1931, Leo Mayer discovered a nearly complete deck of medieval playing cards in the Topkapi Museum of Istanbul, giving the world solid proof that European playing cards originated in the Islamic world. With its ornate design and gold accents, this deck is comparable to the hand-painted, gold-embellished decks that were the rage among Italian aristocracy in the mid-15th century. The deck creator wanted to improve on the Mamluk deck published by Aurelia Books in 1972 and 1977 by brightening the colors, eliminating the added blue panels and using vector graphic software to ensure the design was geometrically balanced. The Topkapi deck is nearly complete with 48 cards including five replacement cards from two other decks. The deck is comprised of four suits numbered Ace through 10 with three or four court cards in each suit (more on that controversy later.) The four suits of Coins, Scimitars, Polo Sticks and Myriads are obvious precursors to Italian playing card suits. The creator of the Trzes deck calls the 43 original cards Type 1; the four replacement cards from another deck Type 2 (Ace of Polo Sticks, First Deputy of Polo Sticks, 4 of Scimitars and Third Deputy of Coins). Type 3 is one replacement card from a third deck, the 10 of Scimitars. The Trzes deck includes the five replacement cards as a bonus, but the missing cards were recreated as well, giving the deck a very unified feel. There is so much pattern and ornamentation going on that reading the cards can be overwhelming; so the deck creator thoughtfully supplied a paper showing the essential design elements as well as telling us which cards are recreations and which are based on Type 2 or 3 replacement cards. The cards are 2.79 x 7.48 inches. The card stock is 310 grams, substantial and lightly coated, so the cards are pleasant to hold and shuffle. The 8-page booklet discusses the suit symbols and their connection with Chinese games, the structure of the deck with respect to the replacement cards, and the differences of opinion between Mayer and Dummett concerning the court cards. In the original deck shown on the website cards.old.no, all court cards have blue panels at the top and bottom with their name in gold on the bottom panel and a few lines of poetry on the top. Instead of a person, each court card has suit symbols: Malik/King has one large suit symbol and an eight-sided tile or stylized flower resting on the bottom blue panel. Unfortunately, only one Naîb (Deputy) and Naîb Thanî (Second Deputy) exist from the original deck, both from the suit of Myriads. They have one and two suit symbols each. This lack of a complete set of court cards, along with replacement number cards that have blue panels like the court cards, has resulted in massive confusion. Leo Mayer wrote an article in 1931 about his newly discovered deck which was reprinted as a book in 1971. Michael Dummett critiqued this book, as well as the Aurelia Books Mamluk deck published in 1972, in three articles in the Journal of the Playing Card Society in 1973-1974. Dummett believes the deck originally had 3 court cards in each suit; that Mayer mistook two of the Kings for a fourth rank he called the Helper. He also mistook replacement pip cards with blue panels for court cards. As pip cards were lost from the original deck, replacement cards were brought in from other decks which had blue panels. As more cards were lost these cards were promoted to court cards. As things got confusing, the court cards needed to be labelled with their name on a blue panel at the bottom. At the right is the Third Deputy of Coins from the Trzes deck which seems to have originally been an Ace of Coins that got promoted. According to Dummett, the researchers behind the Aurelia deck perpetuated the error that there are four court cards per suit. They also believed that pip cards with blue panels came from another deck, so they shifted the blue panels and their inscriptions onto the court cards and redesigned the pip cards. Apparently, blue panels on certain pip cards were in the original deck, which we can see on photos of the museum cards on the website cards.old.no. These blue panels designated the highest ranking pips of each suit. The suits of coins and polo sticks had reversed ranking, like the suits of coins and cups in game of tarot, with the Ace, 2 and 3 ranking highest. But the suit of Myriads has no blue panels, perhaps due to how this suit functioned in the game. The Trzes deck follows Mayer in having four court cards per suit. The issue gets down to whether a blue panel always indicates a court card and is never found on a number card, or if the replacement cards came from a deck where all pip cards had blue panels. The Trzes recreation takes a stand with blue panels only on court cards and with a fourth court rank called the Third Deputy. Shown here is a black and white photo of the Two of Polo Sticks from the museum with a blue panel at the top to indicate a high-ranking pip. Next to it is the Trzes recreation without the blue panel. For the historical purist, I suggest setting aside the five extra replacement cards and the Third Deputies of each suit in the Trzes deck to recreate the presumed structure of the original Mamluk deck. The Chinese invention of games played with little strips of bamboo that you hold in your hands made its way down the Silk Road through Persia, India and the Arab world. Along the way, bamboo was replaced with papyrus and paper. Cards could be round, square or rectangle and the number of suits in a deck varied. By the 1300s, card playing had reached the Mamluk Sultanate in Egypt and taken on the familiar form of four suits numbered ace through ten and three or four court cards. Arab traders and sailors introduced their card games to ports in Italy and Spain around 1370. In less than a decade, cards proliferated throughout Europe. There was no evolution from intermediate deck styles. Playing cards exploded onto the scene as the familiar 52-card deck we still use. Well into the 15th century, cards were associated with their place of origin and known as Saracen cards, or Naipes, after one of the Mamluk court cards. We only know about the structure of the first European decks from written sources, since virtually no playing cards exist from those early decades. Then museum curators in Barcelona discovered 15th-century playing cards being used to stiffen the covers of a book they were restoring. The playing card historian Simon Wintle saw these sheets of cards in the Historical Museum of Barcelona and recognized that they illustrate how Mamluk cards were modified for European tastes. The sevens of each suit are shown here from a deck that was recently printed by Guinevere’s Games. Very little information came with this deck, so we don’t know how many cards were recreated. But Wintle reported there were two sheets of cards in the Barcelona museum. The sheet illustrated in his article contains 12 cards covering all four suits and a variety of numbers. Perhaps with a variety of 24 cards it would be possible to recreate the deck fairly accurately. The suits of Coins and Myriads (Cups) are substantially the same in Mamluk and European decks. Scimitars became straight swords. Polo sticks were unknown in Europe so they eventually morphed into batons. In this deck they are a strange object with a knot in the center that was undoubtably recognizable in 15th century Spain. Court cards are illustrated with people: a seated King, mounted Knight and standing Page. 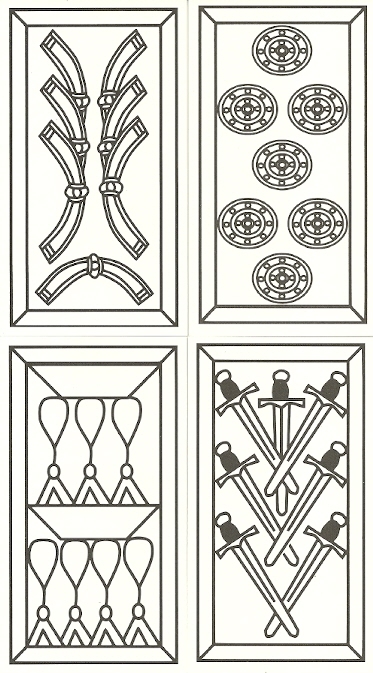 Wintle, in the article referenced below, compares the suit symbols in this deck with various early Spanish and Italian decks and doesn’t find compellingly strong correlations. But he concedes that this deck is a Moorish deck with design elements created by a Spanish printer. He speculates on how and where Mamluk decks entered Europe and which early European decks show their influence. But the bottom line is we have very little hard evidence. All we can do is connect the few dots we have and make up stories based on these connections. How about reading with this deck? Cartomancers have been putting their readings online; so yes, it can be done. I’ve never read with playing cards, and don’t feel the need to use these cards in spreads for traditional readings. It seems to me, the mind-bending profusion of pattern and ornamentation is the whole point. So I like to scry with these cards. Just stare at one card and get lost in an alternate universe. I see conga lines of flowers, elves wearing leaf hats, clusters of eggs, stars that look like cross-sections of apples, sinuous dragons, ginko leaves blowing bubbles, yonis, and lots of crescent moons. I’m sure you’ll find other things. Gaze at a card with a question or situation in mind and wait for a message. Trzes’ Mamluk deck, or the Game of Kings and Deputies. Ulrich Kaltenborn (Trzes-art), 2018. Photo of the 2 of Polo Sticks in the Topkapi Museum taken from cards.no.old. Moorish deck by Guinevere’s Games: the seven of each suit. http://mamluk.spiorad.net/ – website of the Trzes deck creator. Information on the evolution of suit symbols, his design process, translations of the Arabic inscriptions, and his response to Dummett on the blue panels and the number of court cards. http://cards.old.no/1500-mamluk/ photos of Topkapi museum cards arranged in order. http://l-pollett.tripod.com/cards64.htm?fbclid=IwAR0hbRV2NXzWrx0FFqM0DYs6Op9Aem2eZYH4a9q-FdBgNfeMhyYrTGCgkMI – Andy’s Playing Cards. Good background on the cards and the Mamluks. Michael Dummett in the Journal of the Playing Card Society, Volume I, #2, November 1972. Review of the Book Mamluk Playing Cards by L. A. Mayer, published by E. J. Brill, Leiden, 1971. Michael Dummett in the Journal of the Playing Card Society, Volume II, #2, November 1973. Review: A Reproduction Mamluk Pack With Explanatory Booklet. Published by S.A.R.L. Aurelia Books of Louvain and Brussels – printed by Carta Mundi Turnhout. Michael Dummett and Kamal Abu-Deeb in the Journal of the Playing Card Society, Volume III, #2, February 1975. Review: Further Comments on Mamluk Playing Cards. Review of an Essay by Richard Ettinghausen, one of the editors of Mayer’s book. Simon Wintle in the Journal of the Playing Card Society, Volume XV, #4, May 1987. A “Moorish” Sheet of Playing Cards. This was fascinating to read. The history of the cards is so interesting, I think mainly because of the mystery. My partner and I have debated many times where they’ve come from. Also, its very interesting to use them as a scrying tool! “In 1931, Leo Mayer discovered a nearly complete deck of medieval playing cards in the Topkapi Museum of Istanbul, giving the world solid proof that European playing cards originated in the Islamic world.” Please… It is not “solid proof”. European playing cards did NOT originate in the Islamic world. One deck is hardly enough to make such statements. You seem very confident playing cards didn’t originate in the Islamic world. Do you have an alternate theory? Like I said in my article, we connect the few dots we have then make up stories. The Islamic origin story prevails right now. But a new discovery in some obscure archive could blow it out of the water. On the history of playing cards I recommend the new book by Isabelle Nadolny ‘Histoire du Tarot’. She works at the Bibliothèque nationale de France and also had access to many privatly owned documents. She claims it is very likely that tarot originated in Germany, however the Mamluk Playing cards had a great influence on the popularity of playing cards in Italy. I’ve had my eye on Nadolny’s book for a while. I’ve been wanting to explore the German connection with the earliest block printed cards. But I’m a bit skeptical about tarot originating there. Must get her book. Benjamn, Thanks for your comments. I know some scholars have translated the phrases on the cards. But I’m sorry to say I haven’t tried to find those translations, since they aren’t relevant to the Spanish and Italian cards that evolved from the Mamluk cards. I’ve heard them described as poetry, aphorisms and rather obscure. Many thanks, Sherryl, for your friendly review of my deck. There is just one little thing I would like to clarify. 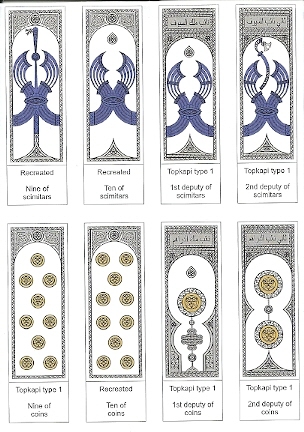 When L. A. Mayer suggested that the Topkapi deck had four court cards, he referred to the altered cards with the added blue patches plus extra type 2 and type 3 cards. He assumed that what we regard as kings in the deck actually came from two different court cards. This was due to some subtle differences in the grammar used in the court titles. Dummett has refuted this idea with some good arguments. My own idea about the number of court cards is about the original type 1 deck instead. It is based on the assumption that the distinction between pip cards and court cards would have been possible by looking at the designs only. Ulrich, thanks for the clarification. I got rather tangled up reading Dummett’s articles. Congratulations on producing such a beautiful deck — it’s creating a lot of excitement in the tarot community. The deck is stunnningly beautiful and historically very significant. Can’t beat that combination!